Maxwell also had a penchant for strong drink and was accused by fellow Officers of letting it effect his command. William Maxwell immigrated from Ireland to the New World with his family by the age of 14. Settling in New Jersey, Maxwell came of age with the ambitions of being a soldier. As soon as he could, Maxwell joined the British Army and soon thereafter served in the French and Indian War. William spent eight years fighting this war, including participating in the ill-fated Braddock Expedition. When hostilities concluded, Maxwell continued with the soldier life, earning respect while stationed at frontier posts. As the American Revolution approached, Maxwell resigned his position in the British Army. He returned to New Jersey and began to speak up at town meetings, specifically incensed at the way British Officers treated their American counterparts as inferior. This despite their better knowledge of the terrain and generally more hardened demeanor. Maxwell joined the New Jersey Militia as a Colonel and led them north to join the fighting in Canada. Unfortunately, he arrived just in time to join Benedict Arnold in retreat. Recognizing his dedication to the Cause, as well as his experience in the field, General Washington brought William Maxwell into the Continental Army. Additionally, William was promoted to Brigadier General. Perhaps Maxwell’s most important task took place in the weeks leading up to the Crossing of the Delaware. Washington ordered William to lead men up the Delaware River and capture or destroy any boats which the British might be able to use. This had the duel effect of prohibiting the Redcoats from attacking the Americans as well as securing many of the vessels which John Glover would soon use transport the Continental Army over the water. Maxwell participated in almost every notable battle in the Revolutionary War’s Northern Department. Furthermore, he was instructed to assemble a Light Infantry unit consisting of several of the Continental Army’s best men. William’s infantry men went on various missions in New Jersey during the winter encampment at Valley Forge. Their main goal was to prevent food and supplies from reaching the British (and their animals). After the Battle of Monmouth, William Maxwell was Court Martialed. John Sullivan led the Court Martial, which acquitted Maxwell of any wrongdoing. To paraphrase the judgment…sure, he was a little drunk, but he still got the job done. By 1780, William Maxwell had found his situation ‘disagreeable’ and wrote to Washington tendering his resignation. It seems that he had several officers again making unproven accusations against his ability to lead. After five years at war, Maxwell was done with the military politics and asked Washington to inform Congress. Washington must have grown tired of William’s troubles because he forwarded the resignation the same day (although he usually made an attempt to talk Officers out of retirement before they resigned). Maxwell second guessed himself and attempted to stop the resignation just a week later, but sadly it was too late. William returned home and, other than one term in the New Jersey Assembly, his career as a revolutionary ended and he faded into the backdrop of American History. Speaking of Resignations, would you like to read about the time George Washington hung up his sword? My article on Thomas Mifflin is just for you. Want to read more about General Maxwell? He has one biography, but it’s very rare (and not old enough to be public domain). 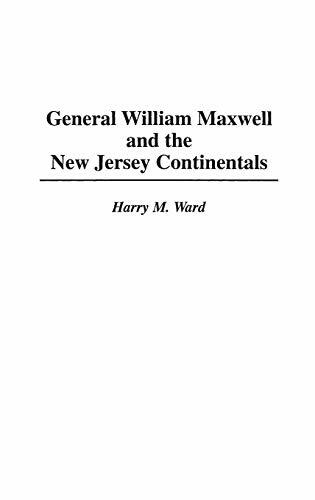 It’s pretty expensive, but if you’re really interested you can pick up ‘General Maxwell and the New Jersey Continentals.’ If you’re feeling generous you can send it to me (smiley face, wink wink).